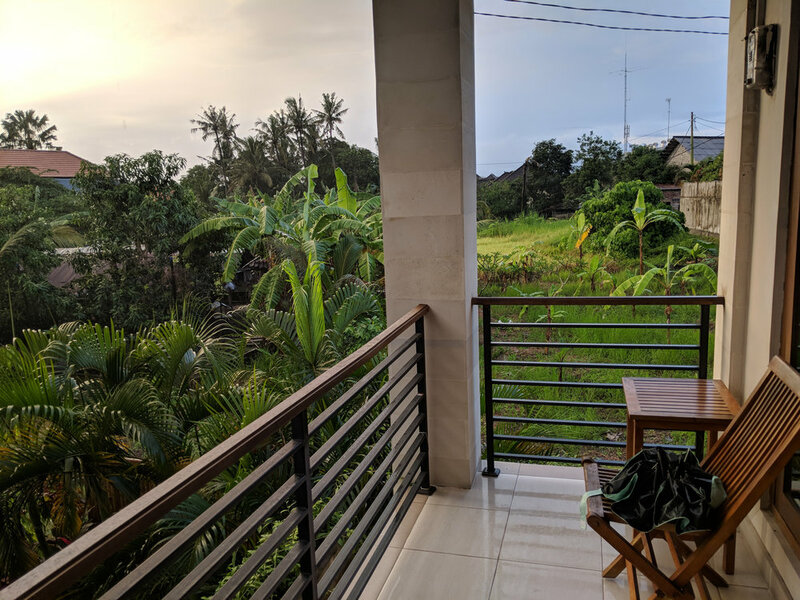 In terms of living space, We Roam has set the bar high here in Bali. There are currently 12ish roamers staying in Bona Kubu, a popular guesthouse here in Canggu. The remaining roamers are staying at two other locations right down the street. The staff has been super friendly. We've learned here in Bali everyone has the same name depending on your birth order. So, all first borns are named, Wayan, which makes differentiating everyone extremely hard. The owner of our guest house refers to himself as "Spunky Monkey." He and his staff have been very accommodating to our crew and helpful as we try to navigate Bali for the first time. Bona Kubu has two large guesthouses with 8 individual rooms in each. We all have our own bedroom/bath and share a balcony. When I walk out of the guesthouse I turn to my right and see lush tropical greens which happen to be home to a few roosters (see first photo below). Let's talk about these roosters.... They will forever be the death of me. They get me up in the morning around 4am.. but the silver lining is.. my day is starting at 6am. Anyone one who knows me knows I'm NOT a morning person... nor a night owl. My prime time is around 11 am. HA.. Anyway, I'm an animal lover but some mornings I would like to put those dern roosters in a cage and drive them to a different farm. :-/ I might be a born and raised farm girl but roosters were never a thing. When I turn to my left, the balcony overlooks this amazing pool. I've had to use this lovely perk more often than not to cool off. I'm calling this my "Bali Bath." As mentioned in my last post, I've been working from 6-9am most mornings while lounging in front of the guesthouse swimming hole. We have breakfast offered to us which consists of hot tea, coffee, toast and fresh fruit. This has been helpful as we don't have kitchens and eat out for nearly every meal. I wouldn't mind this if I only ate 2-3 meals a day..However, I like to eat 4-5 so this has been a bit challenging for me. Still trying to figure out how to maintain normal caloric intake without feeling like I live at a cafe. As you can see in my pictures below my shower and toilet are in the same small space. It's been challenging to not soak the toilet paper as I take 2-3 showers a day. Eye roll. I find this a bit odd but I'm NOT complaining. A working toilet on an island. Score! ... Also, please don't mind the mess as you peruse the photos. Our space is also located in the middle of Canggu, which means everything is a short walk or scooter ride away. We have several amazing restaurants and boutique stores within walking distance. I've already checked out most of the strip and trying to eat someplace new for every meal. I'm anxious to see what our accommodations will be like in Phnome Pehn, Cambodia. City life will be a very different vibe and I'm sure I'll miss having a pool and beach so close. If you're headed to Bali in the near future and would like to stay in Canggu, I highly recommend Bona Kubu. You can book here.